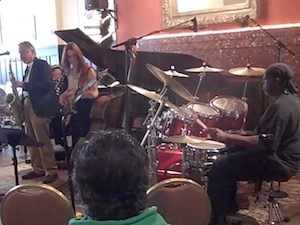 Last Friday, I joined one of the "Deans of Montana jazz", saxophonist Wilbur Rehmann, and two of my UFQ bandmates, Sam Peoples on piano, and bassist Ariane Cap at the Cadillac Hotel for their monthly “Concerts at the Cadillac” series. Bought in 1977 by the late Leroy Looper, the Cadillac became the first non-profit “supportive housing” SRO on the West Coast – a national model, and which shaped Leroy’s contribution to San Francisco. Since 2007, the Cadillac has also been home to the Patricia Walkup Memorial Piano – a fully restored, 1884 Steinway Concert Grand. Leroy, who passed away last month, greatly enjoyed these concerts – and I'll always miss not seeing him in the front row each Friday, tapping his feet along to the music. It's been awhile since I trotted out the beloved Gretsch kit for live jazz, however having recently obtained a brand new 8"x 8" Rosewood tom, I decided it was time go all acoustic, especially with Wilbur back in town for what would be our 6th annual gig, and Sam playing the gorgeous Walkup Steinway. Goodness, Ariane even brought her acoustic bass out for this one! My earlier experimentations with Bruford's symmetrical, timpani set-up was fun, however, the extra tom now gave me an opportunity to go back to my roots with Paul Sears, and reacquaint myself with the music of Billy Cobham, Lenny White and Rayford Griffin; like Sears, all masters of left-handed drumming technique. It also didn't hurt recall the melodic drumming of another mentor, Jack DeJohnette and his recordings with Sonny Rollins. It's no secret that Wilbur is also a huge Sonny Rollins fan and longtime friend, (we both love playing Sonny's "St. Thomas"). Combined with his knowledge of some of the greatest tunes ever written for jazz, and his rich history with longtime guitarist Blackie Nelson, Wilbur has also become a very good composer as well. His latest album, "Old Friends and New", is among his best ever. On a personal note, this was my first performance at the Cadillac since Leroy's passing, so we wanted to do something special. Wilbur also dedicated our performance of "Sunny", to the late Bobby Hebb, the composer of that famed tune who also passed away recently.